I want to break it down into 3 parts for you. The Tablecloth was a super lucky find for me it looks like burlap but it isn't and I absolutely love the rusticness of it. What makes this tablecloth so special for our family is every Thanksgiving we write on the tablecloth with a black fabric marker something we are thankful for. The Centerpiece was so simple to make. We went out into our yard and picked up a bunch of sticks and then cut them to roughly the same size. I grabbed 6 canning jars and holding the stick upright filled the jars half way with fresh cranberries. Easy right? Then to each stick I added one letter to spell the word T-H-A-N-K-S. To make the letters I printed 1 inch letter onto tan card stock and then cut them out with a 1 inch circle punch. Using one size larger circle punch I punched out a circle in red. I adhered the tan circle to the red circle using double sided tape. Once I had all the circles done I whole punched the top of each circle and then tied them to the sticks using raffia. The Chargers and Cups again were simple. The chargers are tin chargers and I happen to love them and they were given to me. You could recreate this look by buying inexpensive plate chargers and spray painting them perty much with whatever color or finish you wanted. The cups I love and again I dove into the canning jar shelf. 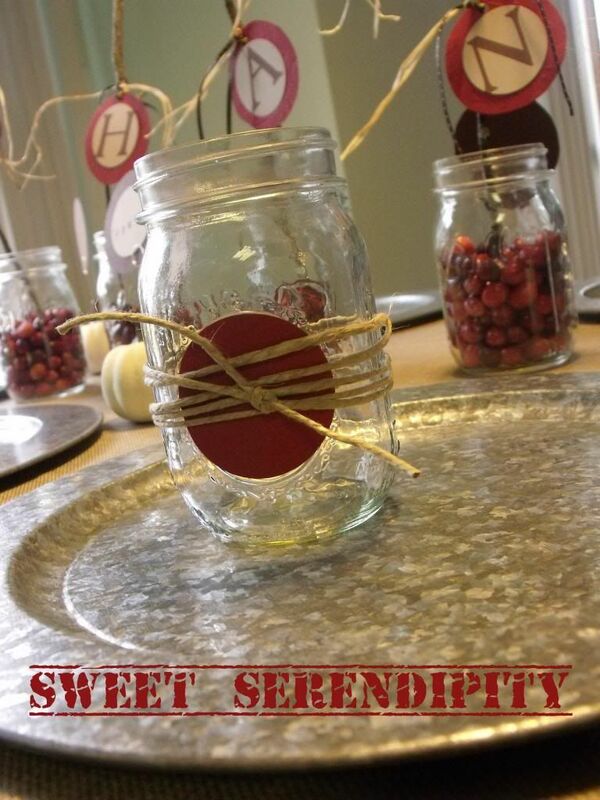 I punched some extra red circles out when I was making the centerpieces and set them aside for this part. I took the canning jars and wrapped them with twine and tied it on with a basic knot. After I centered the knot on the front I slide the red circle behind the knot. Hopefully you can tell from my little picture how rustic and happy it all turned out. I love a nice looking table setting and this was just the look I was going for and I adore how it turned out!! !